This allows you to create uniformity between timesheets, if necessary. Welcome! This article will show you how to access and configure the rounding timesheets settings. The rounding settings are used to simplify your payroll process by rounding unnecessary shift times. For example, if you have employees who tend to start ten minutes earlier than scheduled, you can configure your rounding to automatically (or manually) remove those ten minutes to give the rostered time. Before you get started, you'll need to be logged in as either a location manager or system administrator. If you do not have this access level you will not be able to access the location settings to make the necessary changes. Please note that the rounding settings are unique to each location, so please repeat the process for each one. First please navigate to your Locations tab by clicking "Locations" at the top of the screen. From there, please scroll down and click "Edit Settings" on the right side of your screen, next to your locations. On the left side of the screen, please select "Settings for Timesheets". You will now see the various settings available for timesheet rounding displayed on the right. To turn on one of the settings below, please click it so that is ticked. To turn if off, please click it again so that it is blank. This setting controls whether or not a shift start time is rounded to the scheduled time or anytime after the start of the rostered shift. For example, if an employee is rostered to start at 9:00AM, and bumps on at 8:50AM, their time sheet will be rounded up to 9:00AM. This setting controls which way, and by how much, the start of a time sheet is rounded. For example, if this setting is set to 'closer 5', the time sheet start time will always be rounded to the closer 5 minute block. If it is set to 'later 5' then the shift start time will always be rounded up to the nearest 5 minute block. This setting controls whether or not a shift end time is rounded to the scheduled time or anytime before the end of the scheduled shift. For example, if an employee is scheduled to finish at 5:30PM and bumps off at 5:40PM, their time sheet will be scheduled down to 5:30PM. This settings controls which way, and by how, the end time of a time sheet is rounded. For example, if this setting is set to 'closer 5', the time sheet end time will always be rounded to the closer 5 minute block. If it is set to 'earlier 5', then the shift end time will always be rounded down to the nearest 5 minute block. How do I control when time sheets are rounded? By default, rounding only takes place when you click 'Round' in the 'Time Sheet Approval' area. To make all submitted time sheets round according to the rules you set, turn the 'Enable auto-rounding of real-time time sheets' setting to on. This can be useful in some cases, but understand that every time sheet submitted WILL be rounded according to these settings. If you have some cases in which rounding is not required or is inappropriate, do not use this setting. 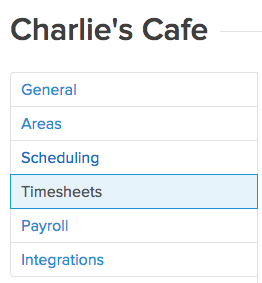 Why Are Other Timesheets Being Rounded? Sometimes you may see timesheets that have been rounded when you did not click the Round button or did not use automatic rounding. You may also see odd shift lengths of one hour when the employee was definitely on-site. This means that an employee did not clock off for their shift within 23 hours, and so the system has automatically rounded the shift backwards. If you see a shift length of one hour, it means that the employee clocked on to the Kiosk for an unrostered shift at the given time, however did not clock off after 23 hours. If the employee was rostered, the system will automatically try to round to their rostered shift duration from their start time if they do not clock off. As an example, if an employee was rostered from 9am-5pm but started their shift at 8:50am, the system would round their end time to 4:50pm if they forgot to clock off.